The extraordinary, unlikely tale of Tycho Brahe and Johannes Kepler, and their enormous contribution to astronomy and understanding of the cosmos, is one of the strangest stories in the history of science. Kepler was a poor, devoutly religious teacher with a genius for mathematics. Brahe was an arrogant, extravagant aristocrat who possessed the finest astronomical instruments and observations of the time, before the telescope. Both espoused theories that seem off-the-wall to modern minds, but their fateful meeting in Prague in 1600 was to change the future of science. 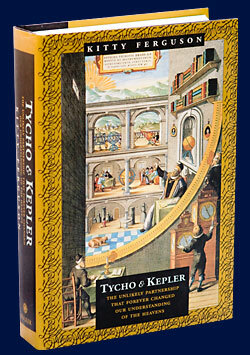 Set in one of the most turbulent and colorful eras in European history, when medieval was giving way to modern, Tycho and Kepler is a double biography of these two remarkable men. "Kitty Ferguson has written a book that has romance . . . it has love, sword fighting, murder, deception, betrayal, trust gone wrong, incredible riches, amazing poverty, reaching for the stars and abject failure, all wrapped in this historical book . . . and it's all one hundred percent true, the most fascinating read about two incredibly interesting people!" "In Tycho and Kepler, we are given the sense of science as a quintessentially human activity, conducted not by disembodied spirits squirreled away in ivory towers but by living breathing, and distinctly idiosyncratic subjects." "Ferguson has a wonderful story to tell. There is political intrigue, religious persecution, academic plagiarism � even a cameo for the real-life Rosencrantz and Guildenstern, two of Brahe's fellow nobles, who paid a visit to England in the early 1590s." "Enlivened with the dramatic pacing of a mystery novel." ©2010-2017 Kitty Ferguson. All rights reserved.